Melt 1 cup of Enjoy Life Dark Morsels in the microwave or double boiler. Line a mini muffin tin with mini paper liners. 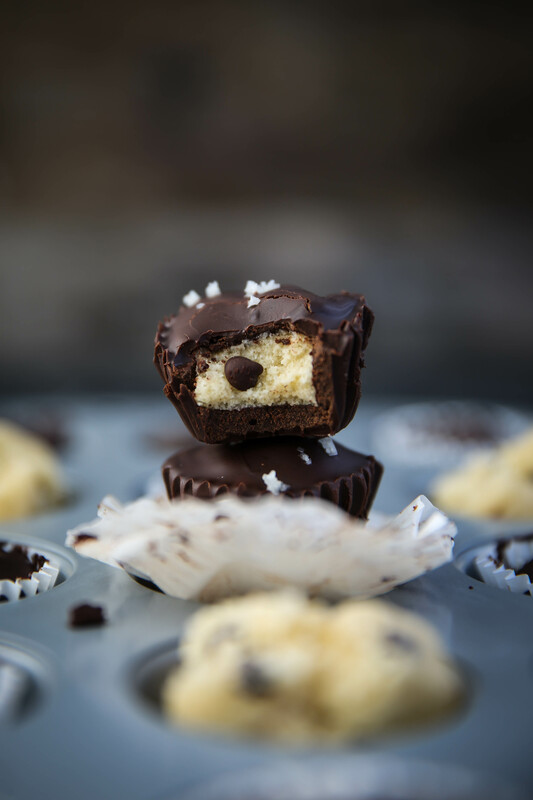 Use a glazing or basting brush or a spoon to spread about 1 tablespoon of melted chocolate in the bottom of each liner and up onto the sides to create a cup. Place in freezer for about 10 minutes to harden. While the chocolate is hardening, use a hand mixer to cream together softened coconut oil (ghee or butter), maple sugar and vanilla extract until combined. Slowly add the cassava flour and salt while the hand mixer is running until all of the flour is combined. Then fold in Enjoy Life Mini Chips. Use a small spoon to scoop the cookie dough into each cup, leaving room around the edges so the chocolate can pour over the sides and seal the cup. Melt the other cup of Enjoy Life Dark Morsels then pour 1 tablespoon of melted chocolate on top of each cup to seal the chocolate on all sides. Sprinkle with coarse salt on top of each cup. Place in the freezer for 10 more minutes to harden. Before serving, set on the counter for about 10-15 minutes to come to room temperature before you consume all 24 cups.